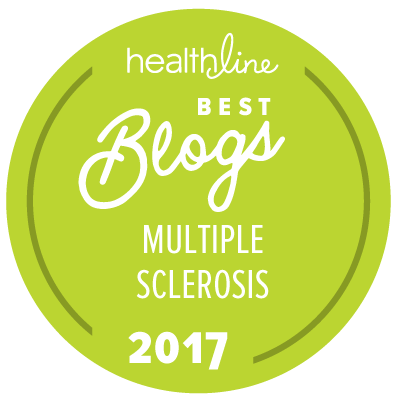 "Loved Ones, Nuances, and Illusions"
When I met my husband in December of 1997 he was already diagnosed with MS - had been on Avonex for 7 months and had recovered from his first diagnosed MS attack which was a doozy that hospitalized him for about a week. He was handsome, had a runners body still, muscular thighs and six pack abs. I was intimidated by how "in shape" he seemed. I knew about MS - a close friend of the family had a severe fast progressing case and she went from being fine to being in a wheelchair and then finally to being unable to breathe on her own within a decade. It was pretty scary stuff. I also knew a friend's mom who sometimes walked with a limp when over tired but was fine most of the time. This was the extent of my knowledge about MS when I met him. 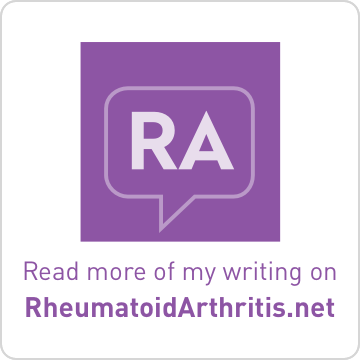 My husband has R/R (relapsing remitting) MS - he has had a lot of relapses in the last decade but many times his symptoms would reverse themselves after a course of steroids. So the day he woke up unable to control his left leg at all and had to use a walker just to get around? Well 3 weeks later he was walking like nothing ever happened. For us MS was a day to day reality in his energy level but the real serious stuff was usually a passing inconvenience. The MS was sometimes at the forefront and a very real reason why he could not do something or go somewhere, but many times it was an excuse too. I don't want to go I have a headache. No way to prove or disprove that, I take him at his word. Sometimes he would go out in crazy heat to do things he wanted to do knowing it would drain him and other times he'd beg off due to heat when it really wasn't hot because he just doesn't want to. I find that MS makes a nice tidy excuse to get out of things and yet I never want to accuse him of that because what if this time I'm wrong? I have never known my marriage without MS as I said above but I did know it before MS was there in our faces daily changing everything. I miss the times when the MS was something that boiled up occasionally and then went back to a slow simmer. About 2 years ago this labor day he had the start of an exacerbation - he had the steroids to halt it but this time they didn't work. He had been on Betaserone for nearly 4 years at this point but it no longer seemed to be helping. He was not seeing a specialist and his general neurologist was way out of his element here. But he didn't admit defeat and send hubby to a specialist, he kept puttering around talking about new possible therapies but not doing anything about it. Finally after almost a year of indecision and inaction on his neurologists part my husband was fed up and asked his primary care physician for a referral back to a specialist. This doctor immediately started the process to get him on Tysabri and took him off Betaserone. He sent him to a physiotherapist to try and regain some of the lost function but it seems that it's gone for good. My handsome husband with the runner's build has lost about 25lbs of muscle over the last decade. His thighs are thin and much weaker, his abs are no longer rippling. He has a drop foot on the left, no balance at all, and a seriously unbalanced and uneven gait. He can only walk a few minutes at a time before he needs to rest and he staggers as he goes. I admire his resolve to not give up and sit down in a chair and just let it go. I also wonder at times WHY he fights so hard - use a chair sometimes it is just to save your strength. But he is a stubborn Italian man and give up is not in his vocabulary. He has been on Tysabri for 8 months now. His doctor says he is showing improvement in involuntary reactions. I wish he would show improvements in balance and walking ability. He doesn't feel like he's getting better. I do think his memory loss is better. For awhile he couldn't remember from day to day things that happened or people said. And he wouldn't admit it was him instead accusing the other person of not having told him. This rarely happens these days - if that is the Tysabri I do thank it for that much at least. I feel like an outsider sometimes. I know more about the disease and treatment than he does because I take the time to educate myself. But no matter how much I know the one thing I can never know is what it feels like, or how it makes him feel. I know how it makes me feel - scared, helpless, alone - and I don't have the disease. 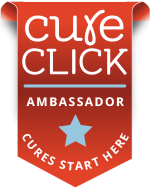 I love my husband and I HATE what this disease has taken from him and by proxy from me. He is still R/R and there is still a chance he could turn around and start getting better but I fear that the best we can hope from the Tysabri is to stop the disease from taking any more. Because it has already taken so much it just doesn't seem like enough. I worry that he will cross over and become secondary progressive, if this happens there is no approved treatment and the insurance would no longer pay for Tysabri. At that point it becomes a wait and see game as in "wait until he dies" basically. Today is Wednesday, August 13th. As per usual I commuted in to NYC via the train across the street from my house. Every weekday that I'm feeling well plays out roughly the same way. I walk across the street with stick at my side and my far too heavy backpack keeping me grounded. Exchange pleasantries with the co-commuters while we wait. Depending on the train I find my place- today it is a long car behind the engine, 2nd seat on the left. Prop stick against the wall, assume commuter position. From the outside looking in, that position is a static one, assumed by the quiet masses. For me it is where the action starts. Depending on that day's distraction -be it the Science Times, the New Yorker, and lately any book by Haruku Murakami- there is an ebb and flow between the read, the thoughts of the moment and the cacophony of the commutation orchestra. All this input is punctuated with the pull of sleep- a not-too-distant memory from a few hours earlier. This is the time-in between the quiet clamor of the daily migration, that I, along side hundreds with whom I share the experience, start my monologue for Wednesday, August 13th. Today I feel different. 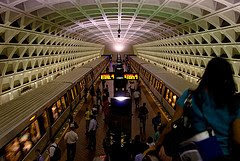 I woke up feeling the dizziness I have felt since December, but as soon as I transitioned from front lawn to platform, I knew this commute wouldn't be the same. While the details on the outside were identical to yesterday's, what was happening on a neuronic level was new. Something barely interpretable, but present none-the-less. Just to be sure I put it to the test. I added flourishes to the action walk up, walk down, walk across repeat. I try increasing my speed slightly and adding a rhythmic jump that I haven't known for some time. So many take a stairway trip for granted. I've watched how effortless it is for most - not a second thought, never even grabbing the handrail. I haven't had that luxury since I was 20. But today, I added a little skip to my downward trend. Taking a moment to experience that minor change, and relish it later as I write- it's a nuance that excited me for what I might notice on the way home. 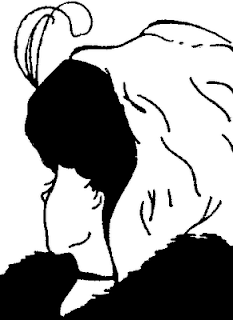 I'm sure by now you've all seen the famous optical illusion of the old woman/young woman in the above picture? You DO see both images, right? The old woman has a feather in her hat as does the young woman looking over/toward her right shoulder?? If not, keep staring at it...it will come to you...eventually. I've decided Multiple Sclerosis is like an optical illusion...very little about the dayumed disease is truly visible, and yet we SEE the disease showing up in our every day lives via fatigue, pain, vertigo, visual changes, etc., because we are LIVING with it. All those nagging symptoms that remain most likely UNSEEN on MRI, blood work, or even physical exam are easily identified through the eyes of an MSer. But for those "outsiders" that just catch glimpses into an MSer's life, it is even more difficult to understand what they cannot "see". When I got to university, conicidentally the same one my father attended, I chose to take sociology rather than English. I had had enough of trying to figure out what authors were alluding to. However, by my third year, I needed more electives to fulfill my degree requirements and I ended up taking a first year English course from a legendary prof, sometimes referred to as Snapper. I was heavily involved with campus radio at the time and he asked me to produce a radio play our class was going to write based on Gulliver's Travels. That was a blast. He also had us divided into groups to come up with a board game based on Beowulf. That was a lot of fun, too. Strangely enough I ended up taking more English courses, including 20th Century American and British Lit from my own Dr. Phil and a drama seminar from Snapper. Snapper was so-called because of his extremely dry and quick wit. In the drama seminar we studied a number of plays dating from ancient Greek and Roman times to the 19th centruy. I admit I was lost during much of the seminar, just not able to see through to the deeper meaning of most of the plays. I guess I was too linear in my thinking at the time as my abstract thinking has improved with time. I don't recall which Shakespeare play we looked at in that class, but the same week we were studying it, a Garfield cartoon appeared in the Sunday comics that made it all clear to me. I've done a brief inernet search and can't find the exact strip but the punchline was "Things are not always as they appear to be". I had a brilliant moment of clarity. Suddenly, Othello, which I had seen at Neptune Theatre in Halifax in Grade 9, King Lear from Grade 12 and now my university Shakespeare play made complete sense. I took the comic strip to Snapper's office and placed it before him. "This is it, isn't it? This is what it's all about!" You'd think I had just won a Nobel Prize or Olympic medal, I was so proud. Snapper read the strip, nodded, and said, "That about sums it up". Since then I have enjoyed a few Shakespeare plays, live, and movie versions. After watching Mel Gibson's Hamlet, I asked my mother to make me a cape like the one Mel wore in the movie. I wear it a couple of times a year on chilly fall and spring evenings with a huge, gorgeous, Scottish brooch on the shoulder to hold it in place. Several years ago I was tutoring a friend's younger sister. This girl was extremely bright but was having difficulty in written communication. We were working on her writing skills for her English course in which they were studying Romeo and Juliet. She was able to identify scenes and acts to illustrate points her teacher had made, something I could never have done in a million years. While working with her, I let her in on the secret to Shakespeare. Remember Three's Company? Every single episode revolved around a misunderstanding of some sort where things were never what they appeared to be. My dad's father, my grandfather, gave my mother a copy of Shakespeare's complete works. It's a 100 year old, leather-bound book that now sits on my shelf. I rarely open it as I still find the language tedious to read and the internet makes it so much easier to look up a reference. The whole point of this post, inspired by Linda at Brain Cheese, is that like Shakespeare's plays, MS offers up as its theme "Things are not always as they appear to be". Some of us are walking, talking, biking illusions. 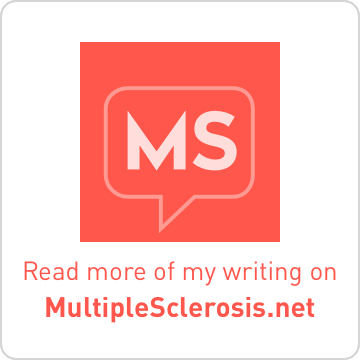 We have MS but don't appear to have anything wrong at all. Some of us have mental deficits that have resulted in having to retire from the workforce early. Some of us have physical deficits that belie the mental acuity we have maintained. Looking at an MRI filled with lesions of the brain, one may conclude a severe disability. Or one lesion may lead to the conclusion of no disability or even symptoms. But we know that presence and number of lesions don't always correspond to disability. And that's why MS is an illusion, a Shakespeare play. We have lesions we want to be rid of, no matter the amount of damage they do. And that's why, like Lady MacBeth, our universal cry is "Out damn spot!" This concludes the 18th edition of the Carnival. The next Carnival of MS Bloggers will be hosted here on September 11, 2008. Please remember to submit a post (via email) from your blog of which you are particularly proud, or which you simply want to share, by noon on Tuesday, September 9, 2008. The 18th edition of Carnival is one of the best...I enjoyed every story. Yet another example of your unwaivering quest to bring together a community of people sharing the common theme of MS. Your carnivals are always such fodder for thought and serve to cover a wide range of both topics and bloggers. Thank you for taking the time to put this wonderful service together!